Red Wall is the next major ravine beyond Fall Canyon, in the quieter northern half of Death Valley National Park but unlike its neighbour there is no road to the entrance nor even a signpost and this canyon is much less often explored despite having comparable scenery. The streamway passes dryfalls, narrow channels, twisted igneous rock formations and variously textured walls with red the dominant colour. 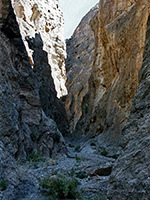 As it progresses far into the Grapevine Mountains on the east side of the main valley the surrounding slopes, initially barren, become covered by fine cacti and yucca as the elevation increases, and the course can be followed for many miles once past the sole major obstacle, a 15 foot chokestone quite near the start. The canyon is situated in the eastern mountains along CA 267, half way between the CA 190 junction and the northern park entrance station near Scotty's Castle. It begins 2.5 miles from the road and may be identified from a distance by a conspicuous change in color of the rocks at edge of the foothills, from red to black. There is no obvious trailhead or starting point; parking is anywhere along the edge of the road about 4.3 miles north of the side track to Fall Canyon. CA 267 climbs slowly from below sea level around Stovepipe Wells and by this point has reached an elevation of 400 feet, enough to look back south over a great expanse of the valley which is visible for over 20 miles towards Tucki Mountain. No permit is required - just a standard Death Valley National Park entry fee, payable at the Furnace Creek visitor center. 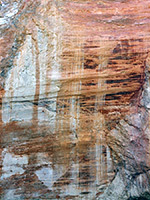 10 views of Red Wall Canyon. TopoQuest topographic map of Red Wall Canyon. Red Wall Canyon exits the edge of the mountains 1,000 feet above the main road, and is separated from it by a vast, gently sloping alluvial fan that takes an hour of quite tedious hiking to traverse - over loose gravel, rocks and boulders, past spiky plants and bushes, and across many flood channels and piles of pebbles. When finally the hills are reached the canyon begins abruptly and is soon deep and impressive, as crumbling, weathered cliffs rise high above. Walking is still quite tiring at first, over shifting gravel and soft sand, but these are replaced by bare, red layered rocks when around a few bends the canyon narrows and the walls become sheer. 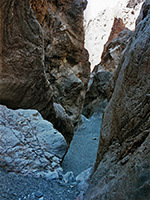 The canyon twists and turns and has cool, dark, slot-like passageways, cut through aged rocks having various shades of grey and red, always rough and weathered, and in places containing white quartz veins running across at angles. 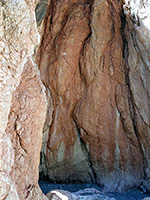 In the middle of this nice section, in a narrow place with vertical strata, a large chokestone has lodged above a dryfall and formed a combined vertical obstruction 20 feet in height. A rope may be left in place here; if not then free climbing would seem to be quite difficult. More narrows follow, then after a final bend with particularly twisty strata there begins a long, more open section. Barrel cacti start to appear, growing in ledges on the crumbling canyon walls at either side, now rather less steep. The streamway gains elevation quite quickly, and the main valley when glimpsed occasionally now seems very distant and a long way below. Eventually a second narrow section begins, although not quite as spectacular as the first it still has some deep places but the cliffs at either side steadily decrease in height. After this the canyon forks, the walls are now not very high at all and this seems a suitable point to turn around, after a walk of 80 minutes - about two miles from the entrance. 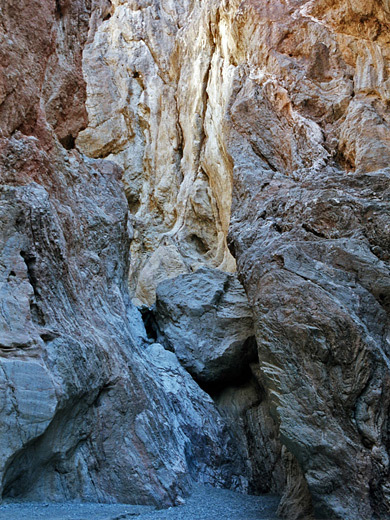 Colorful wilderness gorge, deep in places, bordered by twisted, igneous rocks. Two sections of shady, moderately narrow passageways separated by a longer, open section.